A mysterious girl who boards Hayajiro Koutetsujou and appears at Aragane Station. Mumei in Japanese means No Name or Nameless to signify she has no proper name. This was given to her by her brother. She is revealed to be a Kabaneri as well as a very strong and agile fighter, capable of killing dozens of Kabane with ease. Before Biba gave her the name Mumei, she was known as Hozumi, in which Ikoma guessed the Kanji as "穂積." 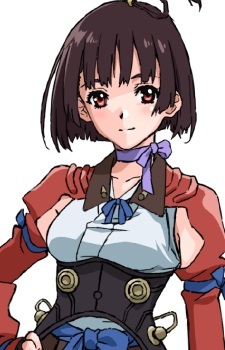 She didn't become Kabaneri from getting bitten by Kabane, but volunteered to be one under Biba's experiment.